Hey hey hey! Guess what? American World Pictures sent me both copies of Zombie Wars (the PA zombie flick) as well as this sweet lookin' diddy, so here you are. Think twilight zone meets a platoon of soldiers. No release date has been set. Reviews coming soon! "For five soldiers, this mission starts out like all the others. An enemy, gun fire, and explosions. But after darting through a bamboo tunnel, something changes. Their mission is clear, but nothing else is. They return to their base campâ€¦itâ€™s deserted. The enemy is out there somewhere...A beautiful woman appearsâ€¦A demonic force rears itâ€™s ugly headâ€¦They feast on a big Family Dinner that appears out of nowhereâ€¦Whatâ€™s happening? Forced to look within, each soldier must face his own destiny and question his fate. Can they be altered? Chosen? Does man have a say in it? Can one man, Captain Jason Briggsâ€¦lead his men to discovery? 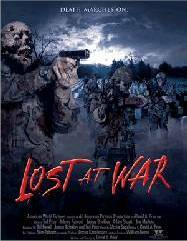 Or will they be Lost At War?"